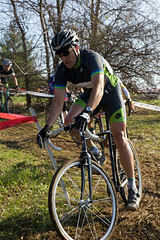 Day two of the Howard County Double Cross took place November 22 in Elkridge, Maryland. In its third year, Rockburn Cross is a Mid-Atlantic favorite that features greasy corners, fast single-track and quick hard climbs. With the sunny open sections and wooded single-track, this course works well on video. It may be paradoxical to say that you can move forwards and backwards at the same time, but this clip shows the possibilities as the camera quickly works its way from the front to the back of the pack. Music is again by our friend, Caleb Stine. It may be a little slower and a little quieter than other tunes featured on CXhairs.com, but music doesn’t have to be hard and fast to be punk. I guess that’s the second paradox of the day. Check out Caleb at www.calebstine.com. thanks for the share…maybe it will make more vintage cyclists more comfortable with techneque and not crashing and burning so much. Haaaaa.